Coastal Customers Featured In The Paper! – Green Energy Now! Coastal Customers Featured In The Paper! The 100th Solarize Ventura customer, Cathy Mims-Keyser is very happy with her new solar installation. The 100th household in Ventura “solarized” through The Solarize Ventura program this week. The discounted solar installation program offered in partnership with the City of Ventura and The Community Environmental Council has been extended through August 7th, providing the opportunity for more Ventura home owners to save money on their electric bills, and generate clean electricity on their roofs. “With discounted, fixed pricing from vetted installers and free solar education through workshops and independent consultation, we are looking to make the whole process streamlined and easier on the customer,” explained Jefferson Litten, CEC’s Director of Energy Programs. 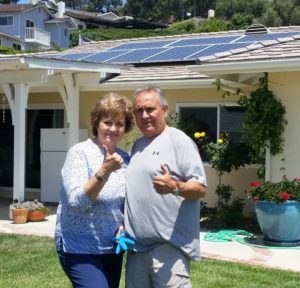 Solarize Ventura features two local solar installers, California Solar Electric and Coastal Solar, who are both offering special discounted pricing for Ventura residents. The firms were selected for Solarize Ventura after careful evaluation and vetting by a committee of local experts. With the program extension, Solarize Ventura is offering one final free home-owner workshop to teach Ventura residents the ins and outs of going solar. Homeowners are invited to attend the final workshop on Thursday, July 21st at The Ventura City Hall Community Meeting Room. The workshop will address the benefits of solar energy, and experts will be available to answer solar pricing, financing, and equipment questions. Interested parties may also visit www.SolarizeVentura.org or call (805) 963- 0583 x 101. Since 1970, the Community Environmental Council (CEC) has led the Central Coast region – and at times California and the nation – in creative solutions to some of the toughest environmental problems. Today CEC is focused on the climate, encouraging global change through local action with five initiatives: Drive Less, Choose Electric, Go Solar, Ditch Plastic, and Eat Local. Home and Garden Show Ventura!